Child soloists – they’re an enigma. Most of the time, even when they’re really good, they flare out quickly. Oftentimes, they’re chosen because they can hit high notes, but not because they are truly talented. And then there’s Meydad Tasa. A kid who had impeccable control, dramatic and artistic feel, and a pure professional quality that was, at the very same time, real and innocent. Two of his child albums, Al Naharot Bavel and Ben Shel Melech, are often playing in a stereo system somewhere in my house. Two truly excellent albums. So the question remained: What would happen to the adult Meydad? Honestly, I was a bit worried when I heard his first mature vocal offering – Kol Dodi, released on the Shmorg (and later on his Ashkenazi-style album Gadol Hashem). While much of the problem there lay with the producers of that song and album – WAY too much orchestration, dudes! – still, was this it? Is that all his formerly golden voice could produce? Thankfully, the answer would be no. A definitive no. And that’s because now we have two excellent albums in his mature stage. (I have not listened to Gadol Hashem completely, but I appreciate the styles of these two over that one, by far – he’s a Sfardi/Israeli; not an Ashkenazi Chareidi. And his true success is with the musical styles of the former, not the latter.) I’ll grant you that I don’t know if he’ll ever be able to top his earlier recordings, but that would be an extremely tall order. For now, let’s enjoy what we have here. Onwards. The record has 3 totally awesome pieces in Kol Ma She’ani (Meydad kicks this one out with appropriate pathos); the Sefardi piyut-like Aufah Eshkona (can you NOT sing this when you hear it?! ); and the eternally positive and very Mediterranean Al Tishaver. Even lesser songs, such as Ben Adam and Melech Malchei Hamelachim are well toned and just, well, energetic. Look, it’s a fun album. He’s a fun artist. This album, Tasa’s most recent, has some awesomeness, and some less. The album DOES have 11 songs, so even if you agree with me and disagree with the subject matters of those three (their tunes aren’t bad), you still have a solid, well stocked record. But even more than that – there are three songs here that are themselves worth the price of admission. Starting with the meh, just to get that out of the way: 1. Another “Ima” song?! For heaven’s sake, that’s his THIRD! At least give your Poppa some respect! 2. HaRav Elbaz Lo Mevater: No disrespect, yo, and while I appreciate the sentiments expressed, a bit of “fanboy” overkill here. 3. Ditto on “Osim Teshuva” – this ain’t a sports team, and this song sounds way too much like a “rah-rah” tune on a very serious subject. Ok – now for real’s. Track #1, Chachama Umushlemet, is awesome. The song bleeds emotion; the lyrics dazzle; and Tasa belts it. The entrée is delicious, the pleading chorus is stunning, the interlude at 2:40 forces me to up the volume every time, the pacing is so elegant and the ending just the way it should be. You may be able to tell – I love this song. In my book, perfect pop production. 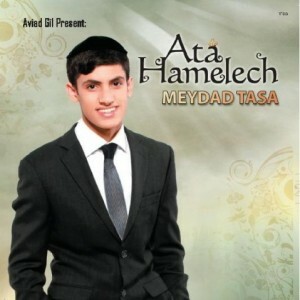 Kama Od Efshar, in which producer Aviad Gil takes the mike alongside Tasa, is another similarly well packaged piece – the delicate piano off chords that begin, as the very poetic and prayerful lyrics amid the light percussion frame Gil nicely. And Meydad takes it over with his lilting voice bringing out the feeling with his unique ability. And the back and forth between the two towards the end of the piece is balanced and tight. And a third song: Lamoledet Shuvi Roni, a Sefardi crooner with an Andalusian style arrangement that Tasa picks up with ease and skill. Strings, plucking guitar and blazing sax combine with the snappy percussion and Meydad’s complete stylistic comfort and vocal nuances to pull you back to a sun-baked desert for a few moments. Those three are, as previously stated, awesome. As for the rest of the album, Na Elokim is another good song – an action-packed thriller. And the rest is standard but enjoyable. Yet another fun, well-rounded collection from this talented young guy. Thanks, Hypo. But I went back and forth whether or not to allow this comment, because it doesn’t really say much besides criticism. In the end, I decided to allow it to point out a flaw in your thinking: What is “more goyish”? Tasa does not sing in an inappropriate manner; his music is not inappropriate in any way. Stylistically, every major Jewish artist out there is using styles that are not traditionally Jewish, but using them for (hopefully) the right purpose – to inspire fellow Jews. If you don’t like the album, fine; your taste decides that. But don’t just trash something as being “more goyish” because you don’t like it. And if you do, in fact, think that there is something specifically inappropriate about someone’s music, state it outright.